I'd like to propose the option to either let me log in once in to my password manager, or have it as a per windows session, and not browser session log in. It's annoying to have to keep logging in to my password vault in Firefox every time I close and re-open the browser. If the option is already in Webroot, please tell me where it is, I can't find it and I was surprised something like this wasn't already in it. No one else uses this PC but myself. Hello Gorg and welcome to the Webroot Community! At the moment, the Password toolbar does not log in by itself, but you can check both boxes for Keep Email and Save Password. This will keep you from having to type it in manually each time. The check boxes are both located right below the login area. I have the latest version, and I only see "Remember me" as a checkbox. It only remembers the email address, still have to input password. I wouldn't mind if the username and password field were saved, so all I had to do was hit "Sign in"
Perhaps the toolbar is a little bit different in FireFox.. I use Chrome. If the FireFox bar does not save both, this idea is a good one and gets Kudo's from me! Gorg, could you confirm you're using Firefox please? I think the functionality exists in Chrome already as David noted. This is intentional to prevent unauthorized password access on a system where the browser has been closed but the system is left unattended. We may revisit this in the future, but for now this closed. So why is it then allowed in Chrome? 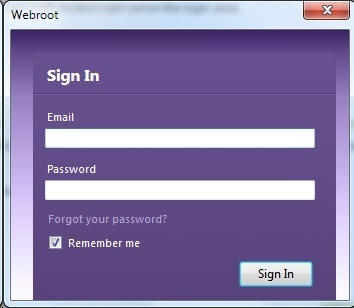 You can save your log in name and password with Webroot in Chrome. If this is the case I will be switching to regular Antivirus when my subscription is up and use LastPass, since that allows you to stay logged in. While Webroot Toolabar does not save the password in IE or FireFox, the LastPass tool does. They both save the password in Chrome. Gorg, I checked myself, and that functionality is actually not in the Chrome extension either. Leaving the browser logged into all of your passwords poses a risk becuause other users of the same computer could easily access your passwords just by opening the browser if your Windows session is still logged in. While certainly some people would sacrifice the extra security for ease of use, many others would not. Our developers are choosing the most secure method in this case. What Chrome allows you to do is save both your user name and password, so all you need to do is hit "Log in". On Firefox, it only allows you to save the username. I guess it's not a huge deal, but it would be nice to just hit "Log in" in Firefox and not have to type the password all the time. I guess I should have worded it differently earlier. It doesn't need to remain logged in all the time, the same functionality that Chrome has would be what I am asking for. My chrome doesnt stay logged in, or log in automatically, but it does save the password to log in. We've set this to Under Consideration so we can investigate standardizing the behavior across browsers. While we may not be able to implement a full auto-sign-in, for the reasons specified before, we do want to maintain a consistent experience across different browsers. Perhaps an alternative would be to allow the option to have a per session logon available that can be switched on/off via the Advanced Settings, i.e., a remember me option, with a warning that use of this is not safe to use on a computer shared with others? I can however quite understand as to why currently the sign on is forced every time the browser is started...it may be annoying but it is by far the safer option. It is actually debatable whether it is the safer option. If I allow Webroot (Lastpass) to generate unique, complex passwords for all my accounts but use a simpler password for my password manager--since I must use that password numerous times per day (I have five systems with multiple browsers on each)--then it creates a single point of failure. I would be willing to enter "[password removed by mods]" (note: this is my actual password, please don’t tell anyone) on each of my browsers once a week, for example, but to do that 10 times per day is onerous. My point is that even Lastpass (owner of the code) does not require this. It’s an option if you choose it but I think that option is rightly left to the end user. Hello. Having just recenently dumped norton i must admit i miss one thing and that is logging in one time and IE, FF or IE all work with the password manager. Having to type it in each time, each browser is an absolute pain. I wish it was a 1 time login and its available system wide until logging out of it and or system reboot. I develop websites so i need all 3 browsers to view work. Any plans to integrate this into password manager? I have also the same problem with IE and FF. I would appreciate very much if Password Manager stay logged when I close my browser and then open again it. A good option for me would be to can go on general settings and choose if I want to remain logged until a new restart of my PC and/or can choose how long I want to remain logged.
? is there any progress with this request? None that I've heard of. I don't think there's any current work being done on the password manager right now. It's Feb of 2017 and still this is not an option for Firefox or Chrome. I paid extra to get the version of Webroot with the password feature and to find that it's just a simplified version of Lastpass, which gives me LESS features than the free version is not only annoying, but to then see not only does it have this issue of having to enter a password (or not have the option to save said password) is the final straw. If they don't intend to change this, then I will look at other AVs when my sub runs out. It should all be about choice. Sure, make it so a person can have it auto log-off, but also give people the other options of making it easier to use for those of us who don't need the extra security. When a person decides to make a much simplier password to login to webroot, just to get around an annoying feature, then you have defeated the entire purpose of having a password mananger. I use my computer in my home, No one else has access to it. I sometimes have to restart my browser session hundreds of times a day. My Smith and Wesson and Mossberg 12 guage keeps intruders out of my home, so I'm not worried anyone is going to steal my password on my home PC. Why should I be treated like I am working in a government building with other people having access to my system? I'm still using RoboForm because of this. I would love to start using Webroot's Secure Password Manager but I visit too many government websites where I log in and after I'm finished with that website most times I would have to close the browser (which the website recommends) to go to another website. Then I have to log into Password Manager again. Way too many log ins to Password Manager IMO. It gets to be a PITA! Interesting idea...I have to say that the current behaviour does not cause me any issues but for those that it does then this is a worthwhile approach.